Learn about the exploring Boston, Massachusetts, by reading Boston's Freedom Trail - Exploring the City of Firsts by Gary Bloom, WTA member and leisure traveler and writer. It features all you'll need to know to plan Freedom Trail walk. At the end of the article, we've provided a summary of the contact information for your easy reference. Enjoy! Boston. The city where "the Lowells speak only to the Cabots, and the Cabots speak only to God." Bostonians may have cultivated a reputation for self-importance. But it is difficult not to be at least a little conceited about a city with so much culture and history, not to mention beauty. Boston is a beautiful and vibrant city, as many port cities are. It's hard to beat the combination of sea harbors, historic architecture, Ivy League schools, beautiful parks, and fine food. Add to that Boston's long list of "firsts" and it's easy to understand why Bostonians may be just a wee bit uppity. This is a city, unlike most American cities, that is easily and best surveyed on foot. The city is compact and most of the sights are a short walk away and the rest can be reached by its public transit system. An exploration of Boston's history begins with the Freedom Trail. A red line painted on the pavement makes this an easy journey through early American history, unlike that of our forebear's. The three-mile walk can easily be made in a day, even with children. The route is well marked, but some areas have heavy traffic, so keep hold of young children. You can take a guided tour provided by the National Park Service that begins every half-hour from the park visitor center at 15 State Street opposite the Old State House. Or if you prefer to ride, you can pay for one of the trolley tours, which are unofficial guided tours. There are 16 historic buildings, sites, and monuments along the way. The trail passes through some of Boston's most interesting and unique neighborhoods. Walking the Freedom Trail is like walking through a history textbook. The trail begins at the Boston Common Visitor Kiosk at 147 Tremont St. where maps are available. A detailed Freedom Trail map is available for $1.50 at the Greater Boston Convention & Visitors Bureau Center, located on Boston Common, but free maps can be found in brochures at hotel lobbies. The Boston Park, one of many Boston "firsts," was the first public park in the U.S. and spans some 50 acres. During the days of the Puritans, the Common was the place where many law breakers were locked in stocks for public ridicule. Just across from the Common is the Bull and Finch Pub, the setting for television show, "Cheers." The restaurant and bar were actually dismantled in England and reassembled in Boston at 84 Beacon St.
Near the Common, at the summit of Beacon Hill, is the architecturally unique State House. Samuel Adams laid the cornerstone and its golden dome is sheathed in copper from Paul Revere's foundry. The State House is one of the most distinctive of all American seats of government, and one of Boston's most recognizable landmarks. In the neighborhoods around the State House are the classic Boston brick row houses, most built in the early 1800's. The Freedom Trail leads next to the Park Street Church, at the corner of Park and Tremont streets. Built in 1809, the church has the distinction of being the stage for the first public performance of the song "America." The Granary Burying Ground next to the church holds the graves of such famous patriots as Samuel Adams, John Hancock, and Paul Revere. Just up Tremont Street is the King's Chapel, built in 1754 and the first Unitarian church in the U.S. The King's Chapel Burying Ground next to it is the oldest cemetery in Boston and is considered by many historians to be the city's most precious piece of land. Boston's first settlers are buried here, including Elizabeth Pain, who many believe was the model for the adulteress in John Hawthorne'sThe Scarlet Letter. Many of the graves have a footstone opposite the headstone, marking off their eternal bed. The beautiful carvings on the tombstones represent what may be the earliest art form in America. The Boston Public Latin school at Tremont and School streets was built in 1640. In yet another Boston "first,' this was America's first public school. Among its students were Benjamin Franklin and Ralph Waldo Emerson. 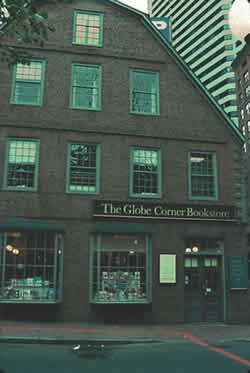 The Globe Corner Bookstore is at the corner of Washington and School Streets. Among its clientele were such notable authors as Nathaniel Hawthorne, Ralph Waldo Emerson, and Henry Thoreau. The Old South Meeting House, also on Washington St., was used by colonists for political gatherings. The Boston Tea Party was organized here. Further up Washington Street is the Old State House, the seat of Colonial government until the Revolution. On July 18, 1776, from a balcony on the east side of the building, the Declaration of Independence was first read. The Old State House is the oldest public building in Boston, and one of the most important public buildings in America. The site of the Boston Massacre is in front of the Old State House, marked by a ring of cobblestones. A good resting and eating place along the Freedom Trail is the Quincy Market. This area, once run-down and avoided, has undergone a major face-lift while retaining its historic patina. There now are elegant restaurants, pubs, and outdoor eating areas. Faneuil Hall, located here, has been used as a meeting place since it was built in 1742. Samuel Adams spoke to the early patriots and inspired the Revolution here, and the hall is known as "The Cradle of Liberty." From Quincy Market the trail winds through the North End, Boston's first neighborhood. For most of the 17th century the North End was Boston, since much of the surrounding land was still under water. The neighborhood today is mostly Italian. There are Italian restaurants, of course, but also Italian bakeries and groceries that display thick slices of pizza in their storefronts. It is hard to resist the aromas of pizza, pastries, and fresh baked bread that permeates the air. Paul Revere made his home in the North End neighborhood for more than 30 years. His house, at 19 North Square, was built in 1676 and is the oldest building in Boston. This neighborhood is also the home of the Old North Church, Boston's oldest church still in use. It was from this church's belfry, on the night of April 18, 1775, that Robert Newman hung two lanterns signaling to Paul Revere that the British were coming by sea. The Copp's Hill Burying Ground is up the street from the Old North Church. Many of the headstones are pockmarked and chipped from musket balls shot by British soldiers who were practicing their shooting. The next stop on the Freedom trail is the Charlestown Navy Yard, home of the USS Constitution, better know as "Old Ironsides." The Charlestown neighborhood is across the Charles River from the North End, but still within walking distance. Old Ironsides is the oldest commissioned warship in the world, and is manned by regular U.S. Navy seamen, who conduct the tours. The ship was launched in Boston in 1797 and never lost an engagement in its many years of service. "Old Ironsides" captured or destroyed 32 enemy ships during its career. The ship gained its namesake in the War of 1812 when its impenetrable hull caused British sailors to exclaim, "her sides must be made of iron!" They aren't, but maybe the next best thing. Live Oak, considered the most durable wood in the world, was specified in its construction. Paul Revere forged the copper bolts used to hold the ship together. There is a museum at the Charlestown Navy Yard, as well as the USS Cassin Young, a World War II destroyer, and the collections of the Boston Marine Society. The Navy Yard itself is a look back at the history of shipbuilding, with one of the oldest dry docks in the U.S., officers' quarters, and a narrow, long building that was used by the Navy to make rope for more than 125 years. In a city known for grass roots government, where politics is not a distant cousin in Washington D.C., but a part of everyday life, it was only fitting that I met up with none other than Ted Kennedy while walking around the Charleston Navy Yard. Sen. Kennedy was there to dedicate a new park. After a short speech at a makeshift stage set up outside, the Senator came around to shake hands with everyone in the audience. The last stop on the Freedom Trail is the Bunker Hill Monument, commemorating the first major battle of the Revolution on June 17, 1775. 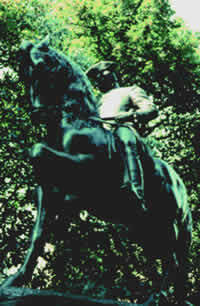 The monument stands on Breed's Hill where 1,200 militia battled more than 3,000 British troops. When their ammunition was nearly out, Colonel Prescott shouted the famous command, "Don't fire until you see the whites of their eyes." The Colonists lost this battle, but with their courageous fight they inspired others to continue the war for independence. The granite obelisk is 221 feet high. There's no elevator, and you'll need to be in good shape to climb the 295 steps up the winding staircase. Beyond the Freedom Trail, there are other sites of Boston to see including its neighborhoods and museums. Having lived in New Orleans for many years, I am no stranger to unique and historic American cities. I didn't think another city could match New Orleans' distinctive neighborhoods, but Boston certainly comes close. The city is so compact you can walk from one historic neighborhood to another. One not to be missed is the Back Bay neighborhood, Boston's showpiece. For a walk back into history, stroll along the gas lit Marlborough St., or Commonwealth Ave., said to be the most beautiful avenue in the world. A city with so much history is bound to have excellent museums. Some of the more notable include The Museum of Fine Arts, containing the largest collection of Asiatic art in the world, as well as silver hollow ware and flatware by artists including Paul Revere. There is also an extensive collection of antique musical instruments. Boston is also home to the world's only computer museum, testament to the importance technology has played in Boston's modern history. The excellent colleges and universities in Boston and nearby Cambridge have been instrumental in providing talent for high technology companies in and around Boston. Speaking of Cambridge, the first phone call was made between Boston and Cambridge. And Harvard was, of course, the first college in the U.S. Not to leave out any other Boston firsts, the city had the first post office, the first street light, the first use of Penicillin, the first department store, the first lighthouse, the first public library, the first subway, the first Christmas card, the first ... well, you get the idea. My wife and I spent three days in Boston during November 2002 enjoying what the city has to offer. The best discovery, was to rediscover the Omni Parker House Hotel, which is located near the start of the Freedom Trail and is within easy walking distance of almost all of the interesting things to do in Boston. Situated just off the NE corner of the Boston Common, there just isn't a more central location for the price we paid. Our accommodations were booked using the WTA Online Travel Booking Service, http://www.worldtravelers.org/travelservices/travelservices.htm, and it saved us over $300 off what the hotel quoted us for the same time frame. We have stayed in hundreds of hotels over the years, in cities all over the world and none of them can, in our opinion, match the staff at the Omni Parker House when it comes to courteous, helpful, competent and just plain all-around nice people. If you are standing in the lobby, someone on the staff will come up to you to just chat and in the process they find out if there are any ways they can help in your enjoyment of your stay. Our room was very nice, not large, but well equipped and the bathroom was equal to any luxury hotel. Considering the price we paid over the three nights of under $400 total, it was a bargain. Boston has much to offer on America's beginnings and the birth of our nation. The Freedom Trail passes by the hotel, and with a map provided by the hotel, it's easy and fun to walk. It wanders past many historical sites as well as several great shopping opportunities and restaurants. Two of our more notable stops were Paul Revere's House and the Old North Church. We discovered some new restaurants that we really enjoyed. The first is Jacob Wirth, located in the heart of the theater district. Their menu is European, slanted toward German fare, with an American flair. The next one is in the North End and is, of course, Italian. Taverna Toscana serves some of the best Italian food that we have ever had, including when we were in Tuscany, Italy, last year. They are located at the very beginning of the North End and it is less than a 10-minute walk from the Omni Parker House. Finally, we recommend a "pub" called the Marshall House. It is on Union Street, next to the Union Oyster House, which is one of the oldest restaurants in America. When it comes to cultural things to do, Boston is right up there with New York City. We attended the ballet at the Wang Theater, Back to Broadway at the Stuart Street Theater, and the Boston Symphony. The highlights of our sight seeing was our visit to the USS Constitution -"Old Ironsides," the Imax Theater, where we saw NASA's "Space Station"(for the third time) and a cruise around Boston's harbor. Along the way, we ventured outside of the Freedom Trail route by taking an Old Town Trolley, a get on and get off tour that includes 16 stops, many on the Freedom Trail, but others more far a field including the big shopping areas, Hard Rock Cafe, Newbury Street, Copley Plaza and much more. All in all a very enjoyable and fun packed three days. Almost all of the sites along the Freedom Trail are, befitting its name, free! And the others have nominal charges or, for the churches along the way, a donation can be made. The Old State House Fees: $3 for adults, $2 for older adults and students, and $1 for children ages 6-18. Open from 9:30 AM to 5:00 PM daily. Call (617) 720-3290 for more information. The Paul Revere House Fees: $2.50 for adults, $2 for seniors and college students, and $1 for children aged 5 to 17. Open daily from 9:30 AM to 5:15 PM from mid-April through October 31, from 9:30 AM to 4:15 PM from November 1 through April 14. The house is closed on Mondays in January, February and March and on Thanksgiving, Christmas and New Year's Day. For more information phone (617) 523-2338. Notice: This information is current as of April 2001 and November 2002. It is recommended that you contact the numbers, and/or visit the web sites above to determine any changes to the information.